Of all the National Parks that I have ever visited in the US, Arches NP is without a doubt the most iconic one. Millions of photographs have been shot here, and to come up with something different is not easy. 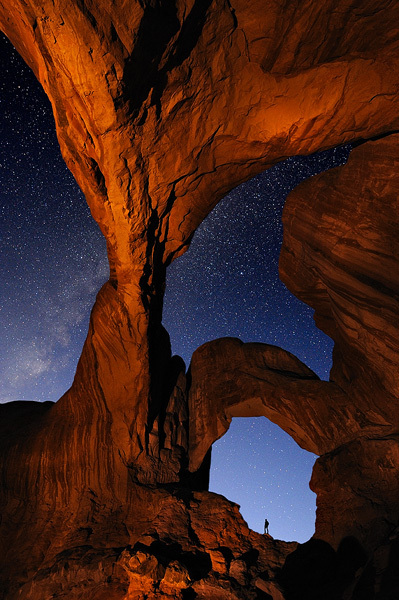 The vast majority of images taken of Double Arch are all horizontals, so I decided to shoot a vertical at night and to bring out the details and colors by using a flashlight. I wanted to include part of the Milky Way, which meant that I had only a very short window of time to take the shot. These decisions were all very important in order to create something original, but the most important one for me was to include a human figure - it brings the shot to life and it acts as a vital scale element.